Tamenglong (Manipur), Apr 5 : He is a harbinger of change and has brought joy to the people of Tousem, a Manipur subdivision considered one of India's most backward, by giving them what they needed most - a motorable road that connects them to the outside world. The opening of the 100-km "People's Road" in February has earned him the sobriquet "The Miracle Man". 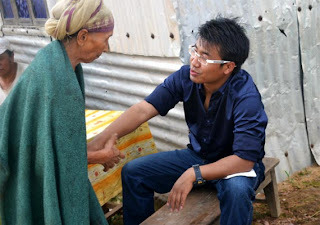 Twenty-eight year-old Armstrong Pame, the sub-divisional magistrate (SDM) of Tousem, which lies in Tamenglong, his home district, and the first IAS officer from the Zeme tribe of Nagaland, is the man who was instrumental in single-handedly taking on the ambitious project of building the road without any state government aid. The road connects Tousem with the rest of Manipur, as also with Assam and Nagaland. The 2009 batch Indian Administrative Service (IAS) officer was moved by the plight of people when he saw how they had to trudge for five hours by first crossing a river and then a stretch that can by no stretch of imagination be called a road to reach Tamenglong just 50 km away. "After writing my IAS exam, I came to Tamenglong in 2007 for some downtime. Since I had seen hardship in my childhood, I decided to travel 31 villages of Manipur on foot to see how the people live," Pame told this visiting correspondent. Talking to IANS in his corrugated-iron house in Tamenglong nestled in the hills, Pame recounted the incident that led him to launch the 100-km road, which has been christened the "People's Road". "In 2012, I became SDM of Tousem. I traveled many villages and saw how people were carrying sacks of rice on their backs, walking for hours, and patients being taken on makeshift bamboo stretchers due to the non-availability of motorable roads. When I asked villagers what they wanted me to do for them, their only wish was for a road," he said. According to Pame, he asked the state government for funds to build the road but was turned down due to paucity of resources. "But I was really moved by the plight of people; so I decided to raise the funds on my own in August 2012 through Facebook," he said. "Charity must begin from home; so I put in Rs.5 lakhs and my brother, who teaches in Delhi University, donated Rs.1 lakh. Even my mother paid my dad's one month's pension of Rs. 5,000," he added. "One night I got a call from a person in the US who wanted to donate 2,500 dollars for the road. The next day a Sikh gentleman living in New York said he would give 3,000 dollars. And after the media reported about this effort, we never looked back," Pame said. In a short span of time, Rs. 40 lakh was raised for the road, he added. "Since Rs. 40 lakh was not a huge amount for building a road, I convinced local contractors to give us earth movers and roadrollers for free," he added.Enthused by the way Pame had been able to put together the resources, the residents of Tousem volunteered to build the road - thus saving labour costs. "Sometimes I still cannot believe that we have done it. It 's a miracle. I don't know whether I can do it again," he said. When asked whether he faced opposition from the state government, Pame said: "I was called crazy, but I was determined." "There is so much to do for the people of Tousem, which lies in sheer neglect. I want to improve their lives in some way because I belong here," he added. Pame's selfless work in a short span of time has earned him popularity and people now call him "The Miracle Man." Zingkeulak, a farmer, said: "Our oranges would rot as there were no roads but after the People's Road, we are able to make some money." "He is one selfless officer. And I believe I will never come across an IAS officer like him," Iram, a resident of Tousem, which is devoid of even basic amenities of life, told IANS. "After giving road to people of this region, he is working on several issues. He is the answer to our prayers," Iram added. Asked what was next on his agenda, Pame said: "There are many things to be done. One of them is to extend the road by another 10 km." "But my mother says stop building roads and build your house first," he offered with a smile.